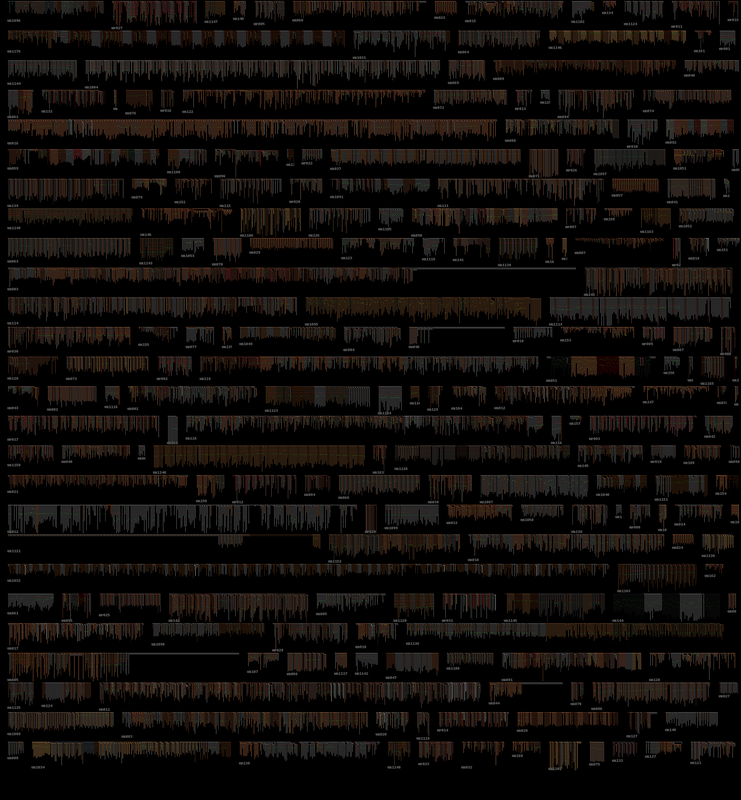 The graphviz visualisations we’ve been using for quipu have quite a few limitations, as they tend to make very large images, and there is limited control over how they are drawn. 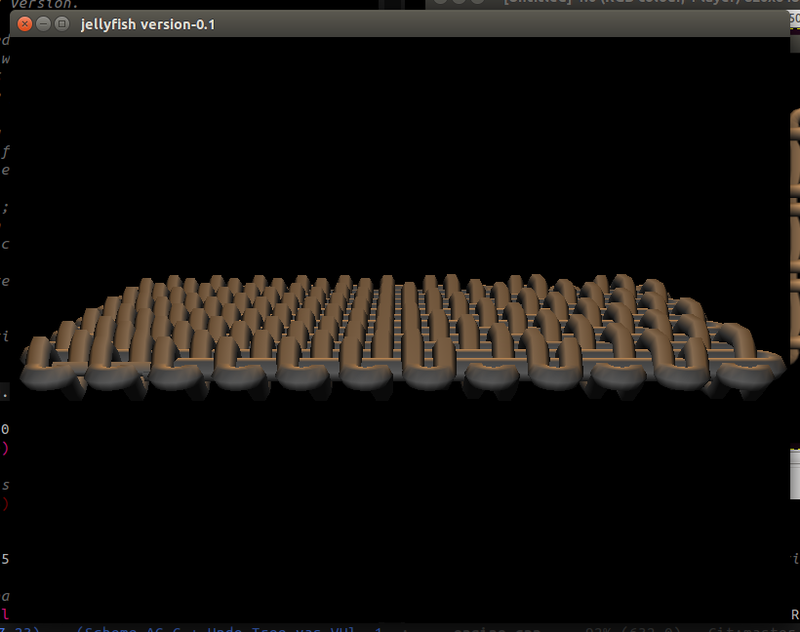 It would be better to be able to have more of an overview of the data, also rendering the knots in the right positions with the pendants being the right length. These are drawn using a python script which reads the Harvard Quipu Database and renders quipu structure using the correct colours. The knots are shown as a single pixel attached to the pendant, with a colour code of red as single knot, green for a long knot and blue as a figure of eight knot (yellow is unknown or missing). The value of the knot sets the brightness of the pixel. The colour variations for the pendants are working, but no difference between twisted and alternating colours, also no twist direction is visualised yet. 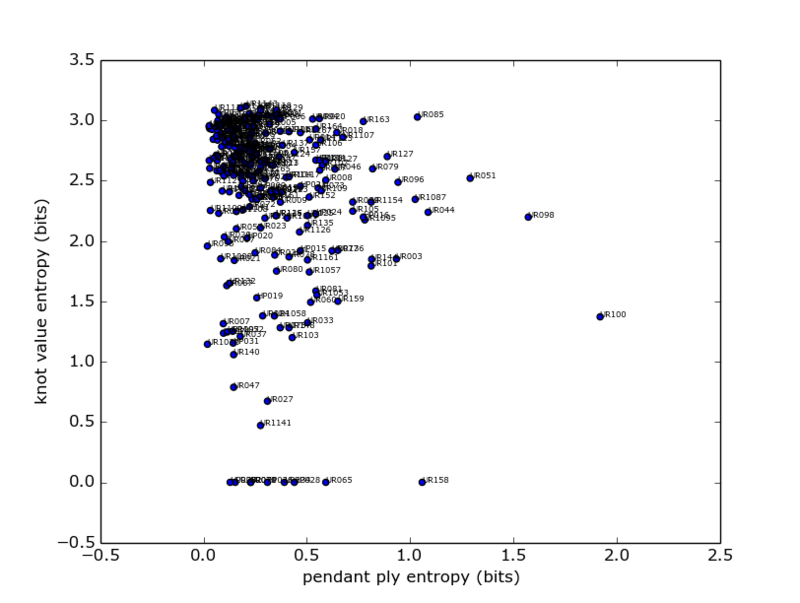 Another advantage of this form of rendering is that we can draw data entropy within the quipu in order to provide a different view of how the data is structured, as a attempt to uncover hidden complexity. This is done hierarchically so a pendant’s entropy is that of its data plus all the sub-pendants, which seemed most appropriate given the non-linear form that the data takes. We can now look at some quipus in more detail – what was the purpose of the red and grey striped pendants in the quipu below? They contain no knots, are they markers of some kind? This also seems to be a quipu where the knots do not follow the decimal coding pattern that we understand, they are mostly long knots of various values. 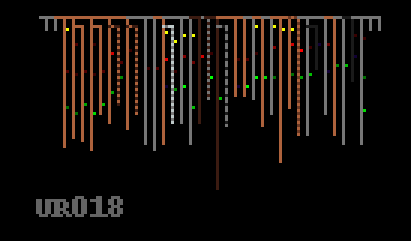 There also seems to be data stored in different kinds of structure in the same quipu – the collection of sub-pendants below in the left side presumably group data in a more hierarchical manner than the right side, which seems much more linear – and also a colour change emphasises this. 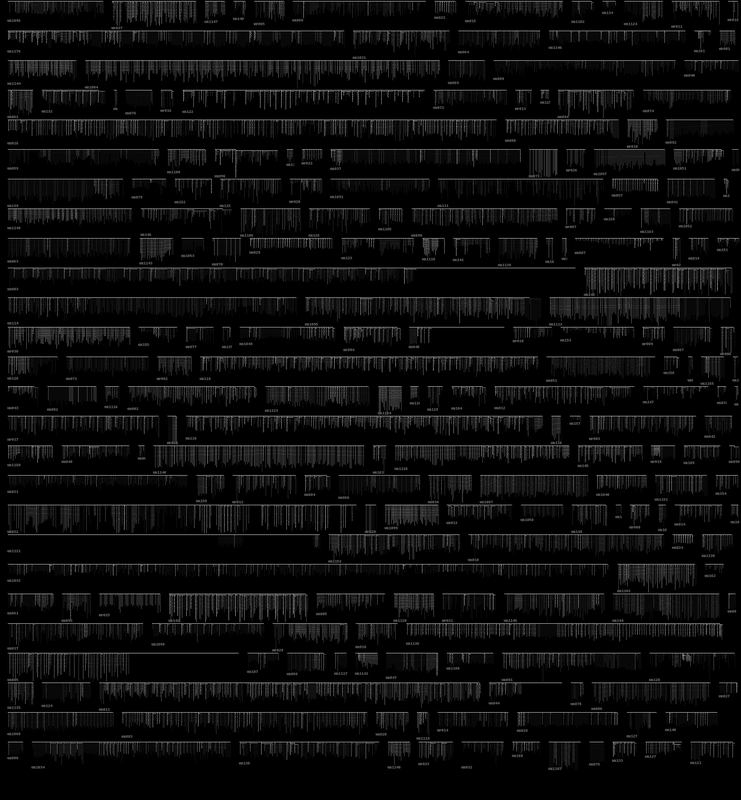 Read left to right, this long quipu below seems very much like you’d expect binary data to look – some kind of header information or preamble, followed by a repeating structure with local variation. The twelve groups of eight grey pendants seem redundant – were these meant to be filled in later? Did they represent something important without containing any knots? We will probably never know. 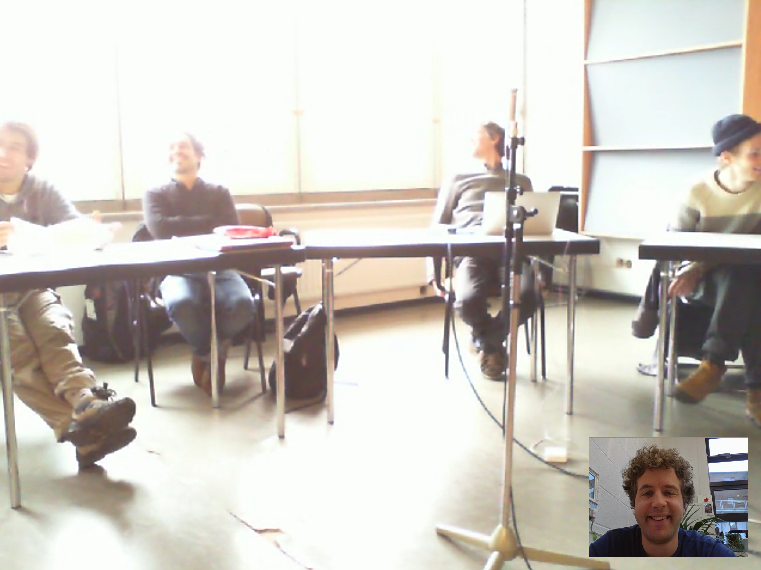 A report on further experimentation with Julian Rohrhuber and his students at the Institute for Music and Media in Düsseldorf during our coding with weaves and knots remote seminar this week. 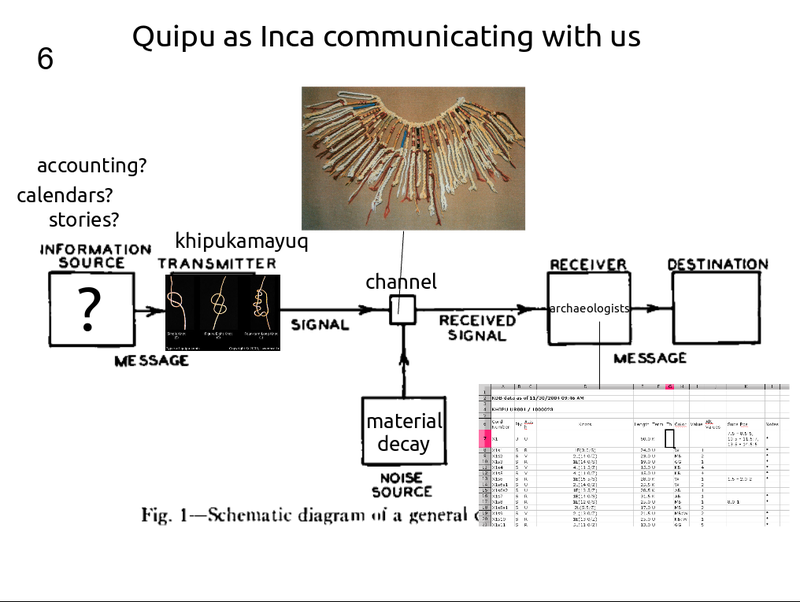 As we have so little idea what the Inca are telling us in their Quipu, it seems appropriate to add a cryptanalysis approach to our toolkit of inquiry. 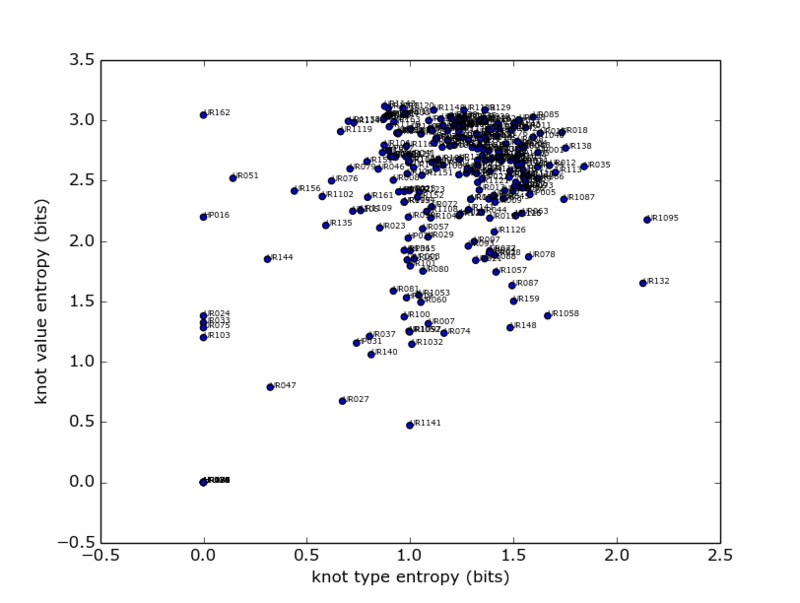 One of the first things that a cryptanalyst will do when inspecting an unknown system is to visualise it’s entropy in order to get a handle on any structures or patterns in the underlying information. This concept comes from Claude Shannon’s work on information theory in the 40’s, where he proved that information obeys fundamental laws of physics. The concept that information and “cyberspace” may not be as intangible and otherworldly as we might believe (in fact is grounded in physical reality along with everything else) is one of the recurring themes of the weavingcodes project. Shannon’s innovation was to separate the concepts of data quantity from information value, and he claims that information is equivalent to surprise – the more surprising a piece of data is, the more information it contains. Conversely a piece of information which we expect to hear by definition doesn’t really tell us very much. The potential for some data to be surprising (or more specifically it’s potential to reduce our uncertainty) can be measured statistically, with a quantity he called entropy, as it is analogous to states in thermodynamic systems. Shannon defined a generalised communication system, which is handy to give us a way of reasoning about our situation in relation to the Inca. Our main unknown is the source of the messages they are sending us, are they accounting information, calendars or stories? We know a bit more about the transmitters of the messages, the khipukamayuq – the knot makers and quipu keepers. At the time Shannon was working on information theory, he was part of the start of the movement away from analogue, continuous signals and towards digital signals – with advantages that they are highly resistant to noise and can be carried further and combined together to increase bandwidth. Quipu are also mainly comprised of digital information – the type of a knot, the number of turns it’s comprised of or the twist direction of a thread are all discreet (either one thing or another) and therefore highly robust to material decay or decomposition. We can still ‘read’ them confidently after 500 years or more without the digital signal they represent being degraded too badly, if only we could understand it. 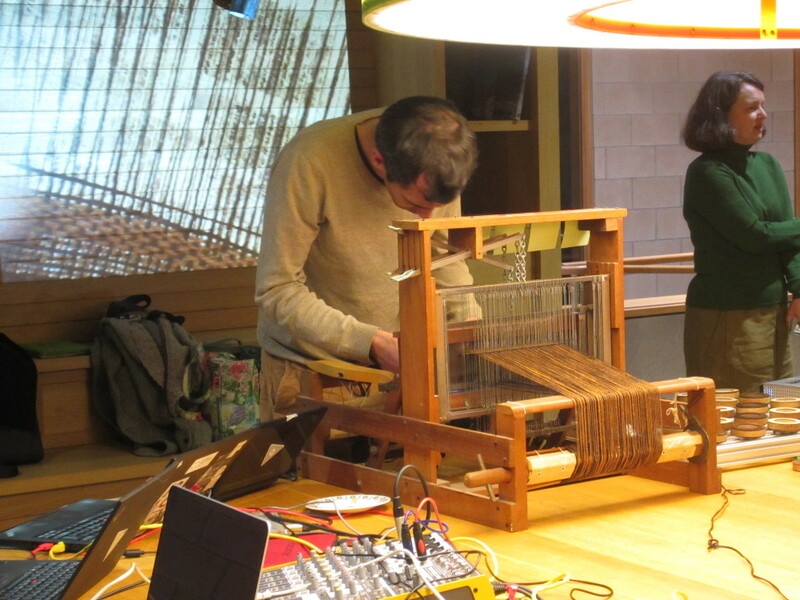 At the same time, none of us working on this have access to a real quipu, so our receivers are the archaeologists and historians who study them, and compile archives such as the Harvard Quipu Archive we are using. This graph is calculated by making lists of all the discreet data of the same type, e.g. 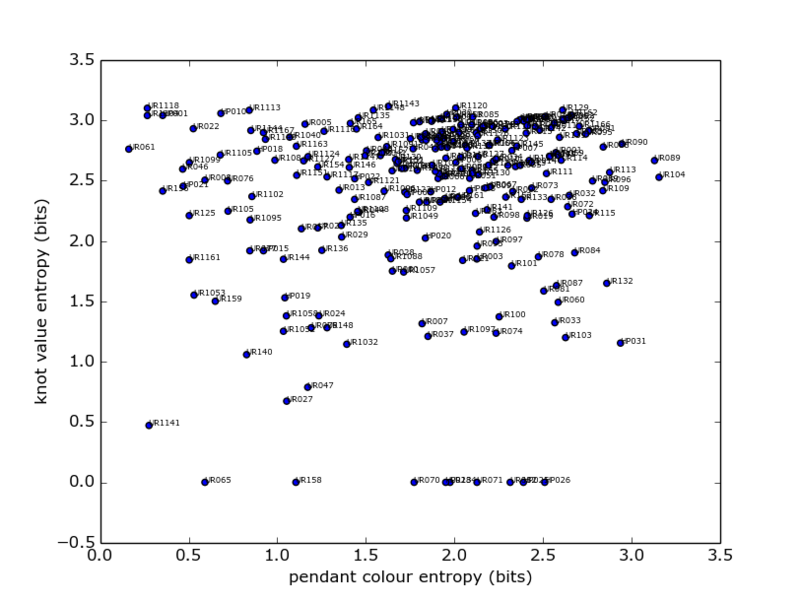 knot value, type, tying direction, pendant colours and ply direction (ignoring lengths and knot positions as these are continuous) – then calculating Shannon entropy on histograms for each one and adding them together. At this point the most useful aspect of this work is to give us some outliers to inspect visually and sonically – more on that soon. 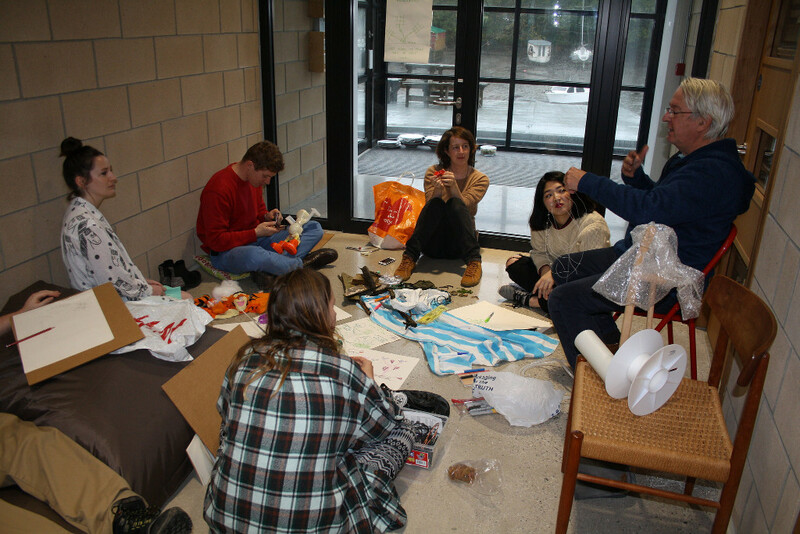 Busy times at Foam Kernow, here are some photos from the Machine Wilderness Workshop weekend before last. This was a project between Foam Amsterdam and us, with 30 participants from all over the place geographically and professionally. My role was as facilitator, so mainly obtaining raw materials (electronic toys, recycled trash and e-waste) as well as a bit of cooking and general running around which I found very enjoyable. 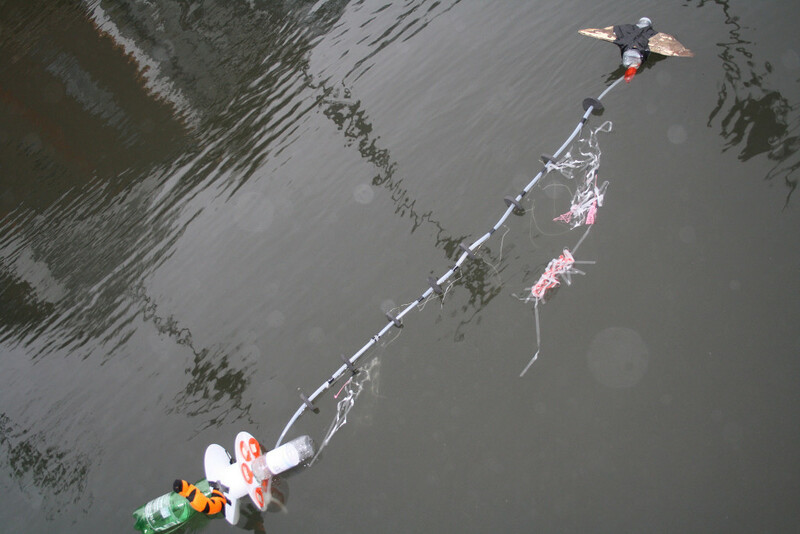 The machines invented and prototyped were grounded in the environment of the Penryn river in Cornwall, so common themes were seaweed biomimicry and experiments with estuarine mud, both as a surprisingly rich power source as well as a design medium in it’s own right. I’ll leave the in-depth write ups to those leading the event, but one of my interests was to see how a workshop involving e-waste would work, practically and as an inspiration – with an eye to doing this with primary school kids and teachers. We managed to locate a good quantity of old toys from various local second hand stores and warehouses, quite a modest outlay in return for some very good mechanics, motors and electronic parts. Resisting the temptation to take them to bits beforehand meant that the participants could open them up and discover what they could use, one of the best items was a bubble machine – inside was a good air pump and lots of mechanics (total cost ~£1.50). 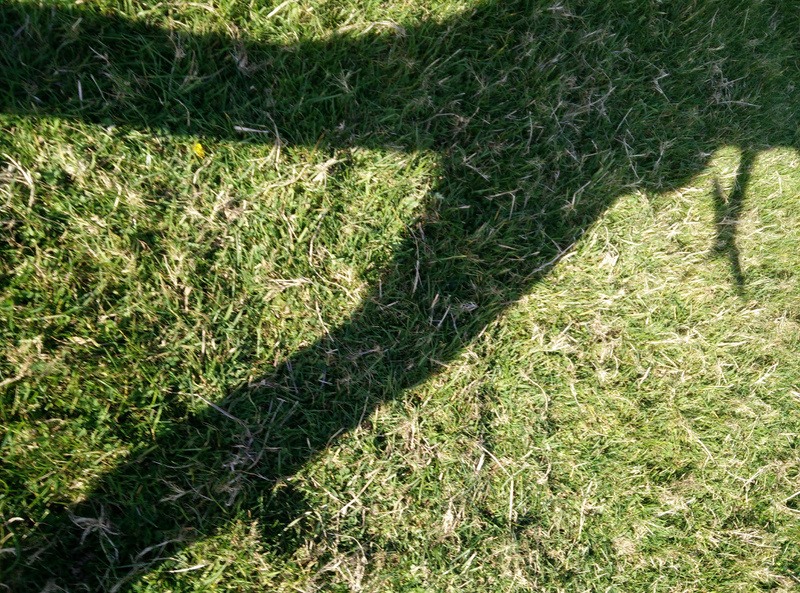 This was incorporated into a robot lifeform that was in part augmented by moss growth and LED lights. See the rest of the photos here. 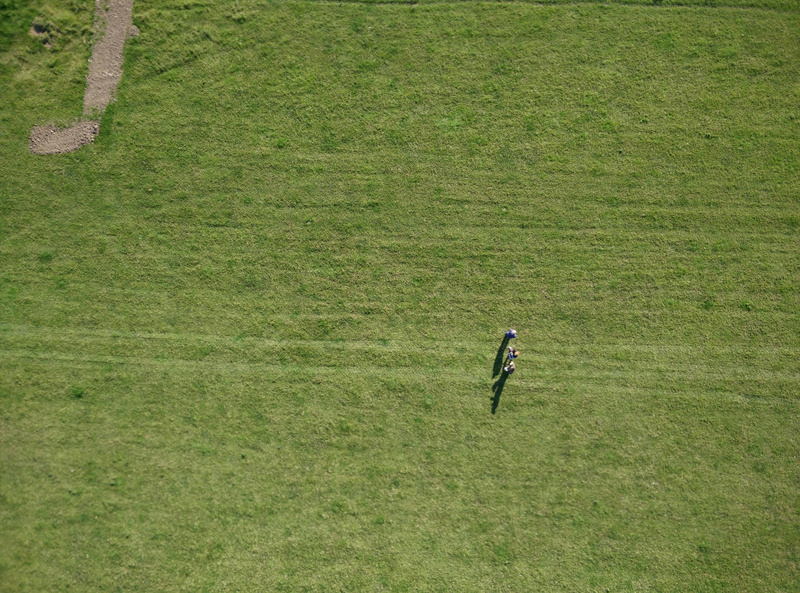 The UAV toolkit’s second project phase is now complete, the first development sprint at the start of the year was a bit of research into what we could use an average phone’s sensors for, resulting in a proof of concept remote sensing android app that allowed you to visually program different scripts which we then tested on some drones, a radio controlled plane and a kite. 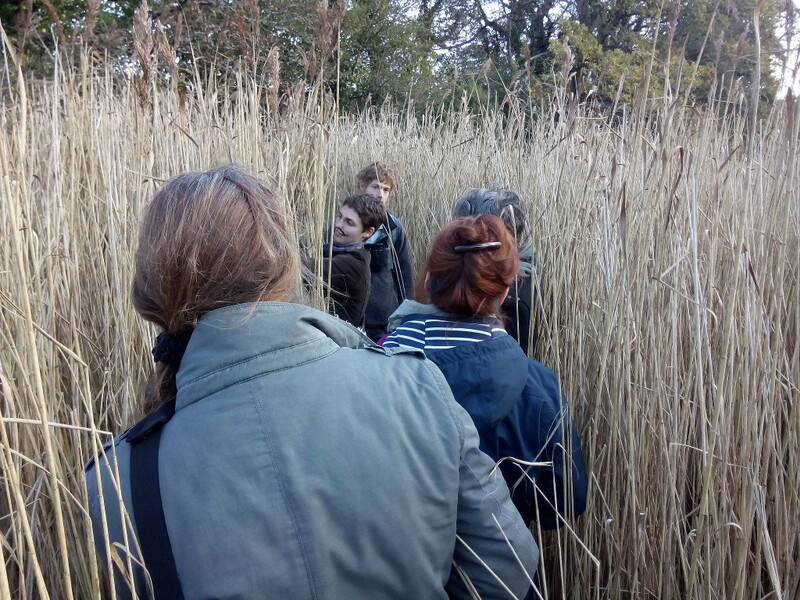 This time we had a specific focus on environmental agencies, working with Katie Threadgill at the Westcountry Rivers Trust has meant we’ve had to think about how this could be used by real people in an actual setting (farm advisors working with local farmers). Making something cheap, open source and easy to use, yet open ended has been the focus – and we are now looking at providing WRT with a complete toolkit which would comprise a drone (for good weather) a kite (for bad weather/no flight licences required) and an android phone so they don’t need to worry about destroying their own if something goes wrong. Katie has produced this excellent guide on how the app works. 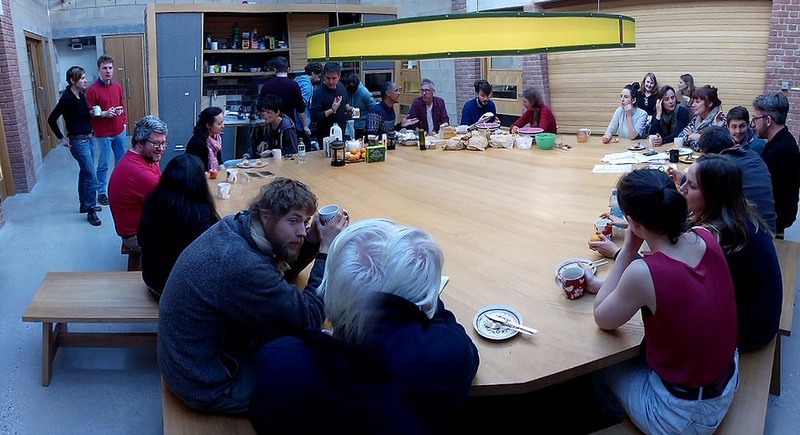 The idea of appropriate technology has become an important philosophy for projects we are developing at Foam Kernow, in conjunction with unlikely connections in livecoding and our wider arts practice. For example the Sonic Bike project – where from the start we restricted the technology so that no ‘cloud’ network connections are required and all the data and hardware required has to fit on the bike – with no data “leaking” out. With the UAV toolkit the open endedness of providing a visual programming system that works on a touchscreen results in an application that is flexible enough to be used in ways and places we can’t predict. For example in crisis situations, where power, networking or hardware is not available to set up remote sensing devices when you need them most. 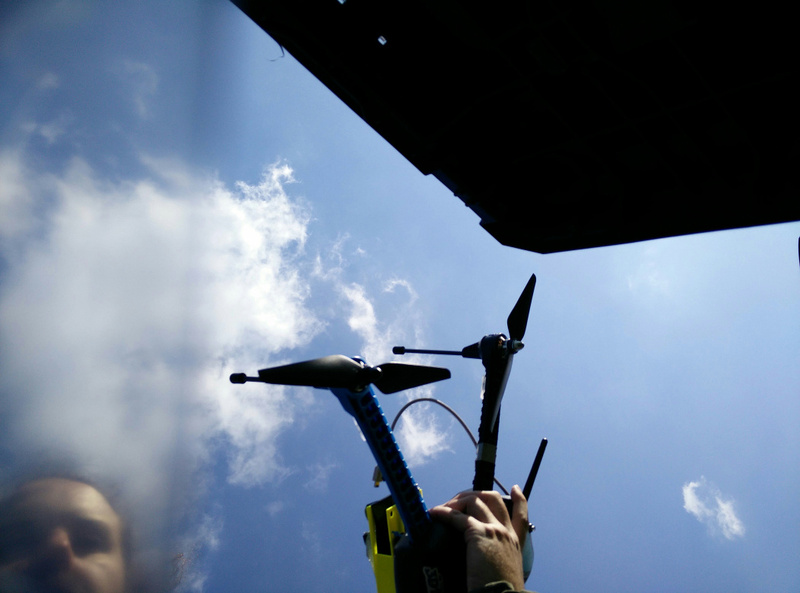 With the UAV toolkit we are working towards a self contained system, and what I’ve found interesting is how many interface and programming ‘guidelines’ I have to bend to make this possible – open endedness is very much against the grain of contemporary software design philosophy. The “app ecosystem” is ultimately concerned with elevator pitches – to do one thing, and boil it down to the least actions possible to achieve it. This is not a problem in itself, but the assumption that this is the only philosophy worth consideration is wrong. One experience that comes to mind recently is having to make and upload banner images of an exact size to the Play Store before it would allow me to release an important fix needed for Mongoose 2000, which is only intended to ever have 5 or 6 users. For the UAV toolkit, our future plans include stitching together photos captured on the phone and producing a single large map without the need to use any other software on a laptop. There are also interesting possibilities regarding distributed networking with bluetooth and similar radio systems – for example sending code to different phones is needed, as currently there is no way to distribute scripts amongst users. This could also be a way of creating distributed processing – controlling one phone in a remote location with another via code sent by adhoc wifi or SMS for example. 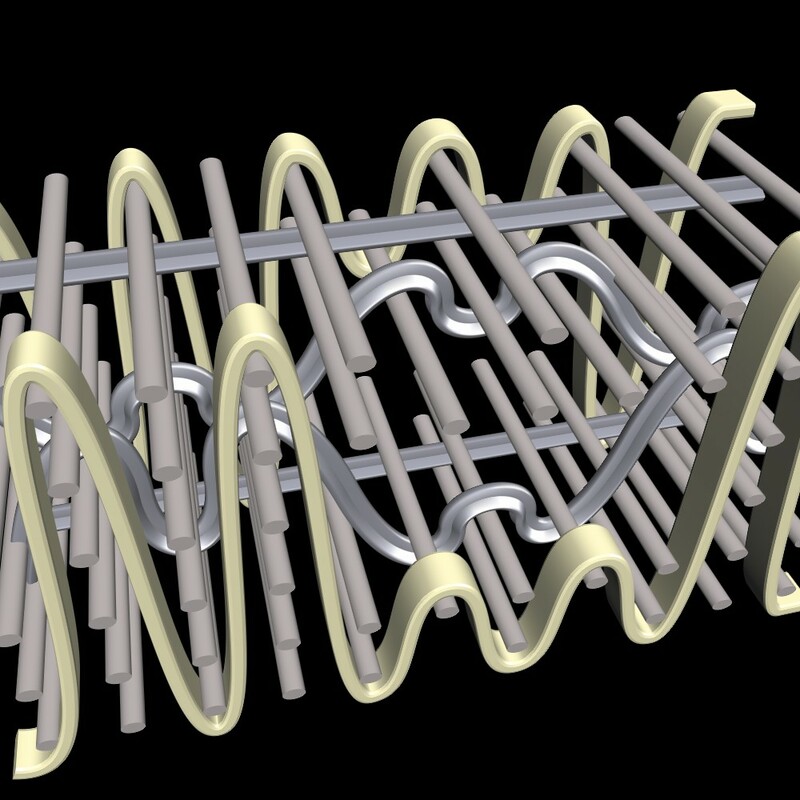 We’ve been working on new approaches to 3D rendering ancient weaves, using Alex’s new behavioural language (which describes a weave from the perspective of a single thread) as the description for our modelling. This new approach allows us to build a fabric out of a single geometric shape, where warp and weft are part of the same thread. I’m still learning this language, but more on that soon. 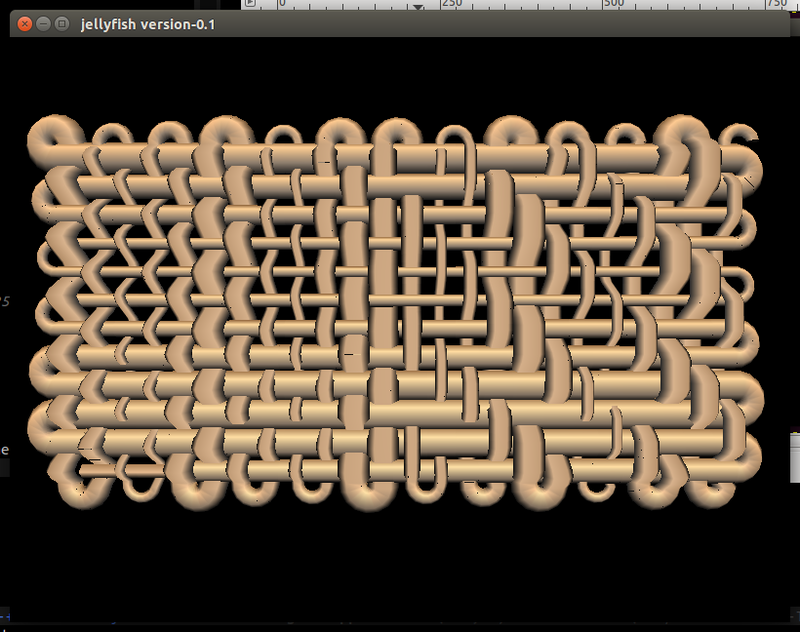 This line produces an large list of instructions the weave renderer uses to build it’s model, turning the thread and shifting it up and down as it crosses itself. 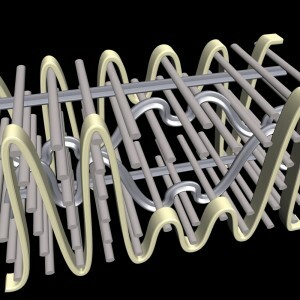 In the video in his last post Alex describes using this to mix two separate weaving techniques together, which is one of our main reasons for developing this language – existing weave simulations cannot replicate the weaving technology of the ancient Greeks who for example, combined tablet and warp weighted weaving in the same fabric. 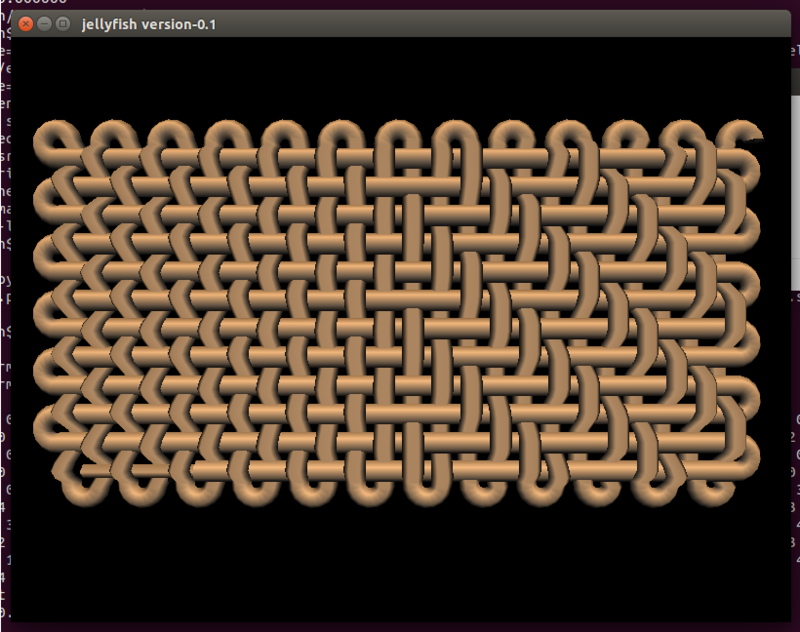 We can also now introduce other changes to the yarn structure, for example modifying the width using a sine wave. I still have a few glitches to fix as you can see above, but here is a video of the development process from the first script, getting the polygons lined up, fixing the turning, adding over/under, reading Alex’s code and finally lining everything up. 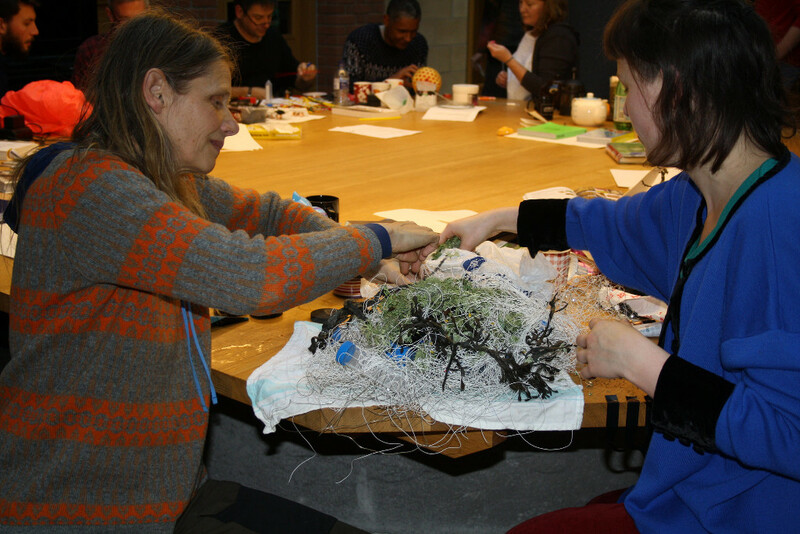 Last week the weavecoding group met at Foam Kernow for our Cornish research gathering. As we approach the final stages of the project our discussions turn to publications, and which ideas from the start need revisiting. While they were here, I wanted to give local artists and researchers working with code and textiles a chance to meet Ellen, Emma and Alex. As we are a non-academic research organisation I wanted to avoid the normal powerpoint talks/coffee events and try something more informal and inclusive. 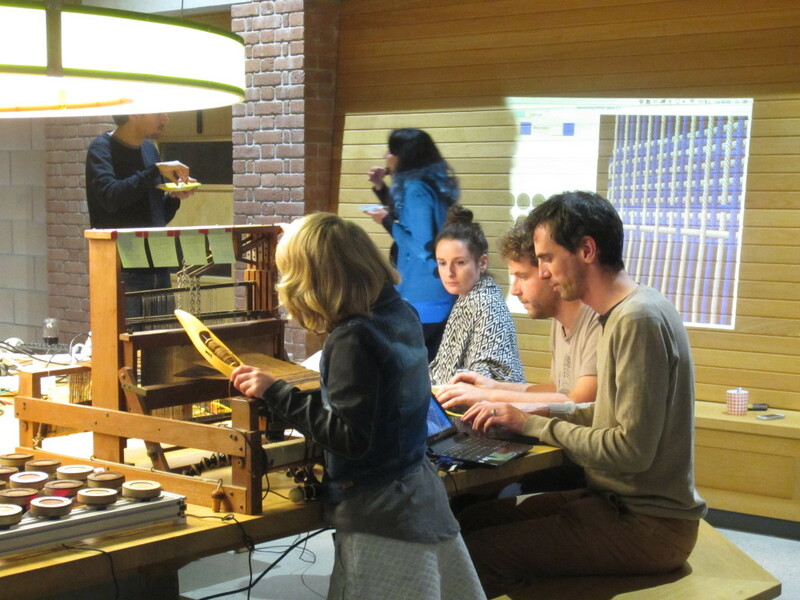 The newly warped table loom with a live camera/projection from underneath the fabric as it was woven with codes for different weaves on post-it notes for people to try. The tablet/inkle loom to represent ancient weaving techniques. 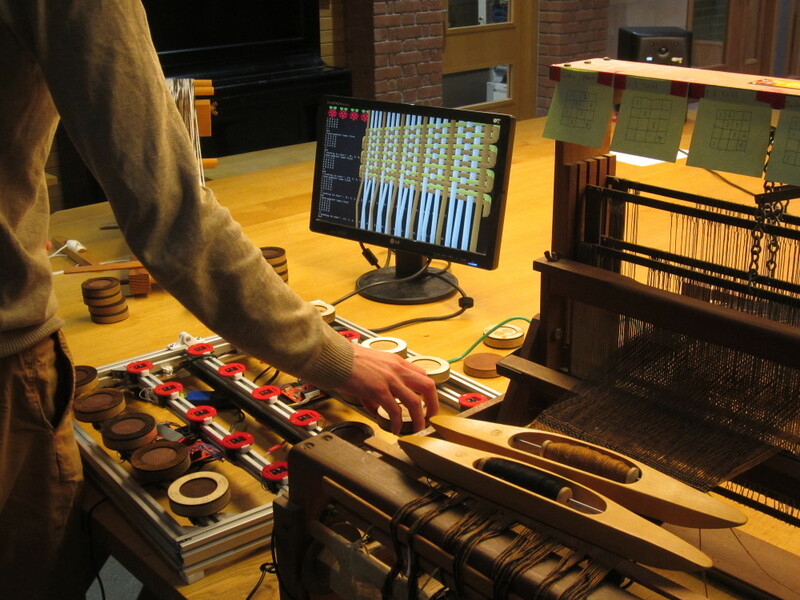 The pattern matrix tangible weavecoding machine and Raspberry Pi. 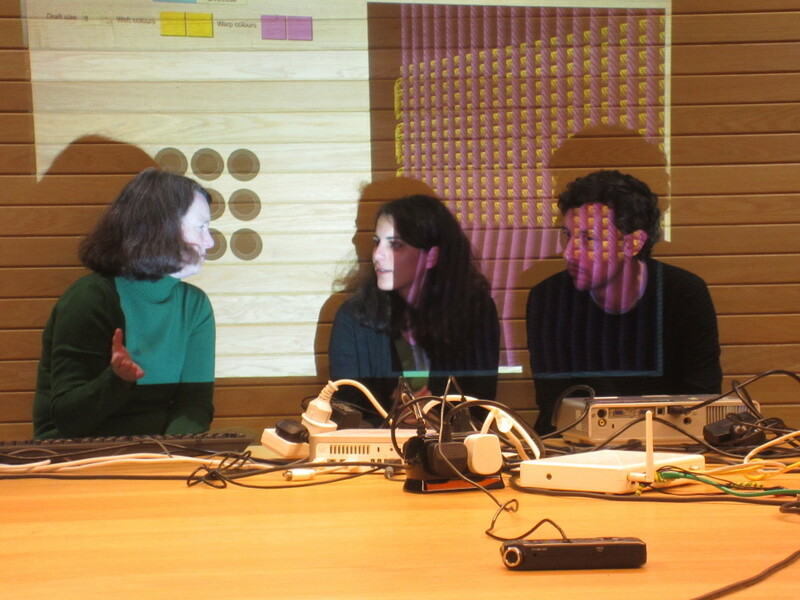 A brand new experiment by Francesca with a dancemat connected to the pattern matrix software for dance code weaving! This provided an opportunity for people to try things out and ask questions/provide discussion starting points. Our audience consisted of craft researchers, anthropological biologists, architects, game designers and technologists – so it all went on quite a lot longer than we anticipated! Alex and I provided some slub livecoded music to weave by, and my favourite part was the live weaving projection – with more projectors we could develop this combination of code and weaving performance more. Thanks to Emma for all the videos and photos!